So for the past month, hubby and I are eating more vegan/vegetarian. Last night he turned to me and asked if I could make something sweet for him…like a cookie. Up until now, the only sweet treat we’ve had is some “nice cream”. Which isn’t really ice cream. You take frozen bananas and blend them up and it becomes the consistency of soft serve ice cream. Tastes delish. But hubby was wanting more…something chocolatey. Enter in my quest for a vegan chocolate chip cookie. I immediately started searching Pinterest and YouTube. Surprisingly, there are a large number of recipes out there. I found recipes that followed more of a traditional approach, using all purpose flour and simply substituting the eggs and dairy. I also found recipes that really pushed the boundaries and whose ingredients were surprising, going with a gluten free approach. And then I found ones that were very simplistic and that sparked my interest as well. So since I couldn’t decide on just one, I decided to make all 3! And this the tale of 3 vegan cookies was born! So for my first cookie, the more traditional cookie recipe, the one I tried was from Food52.com. 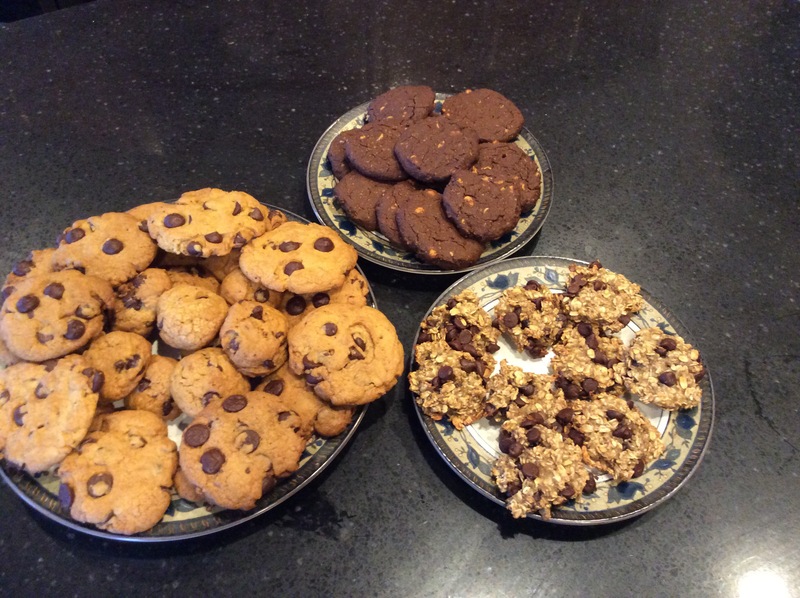 Here is a link to the recipe —> Vegan Salted Chocolate Chip Cookie. It was suggested to let the dough rest for 12-24 hrs for maximum deliciousness. I refrigerated mine for 15 hrs. I thought that was a good compromise. 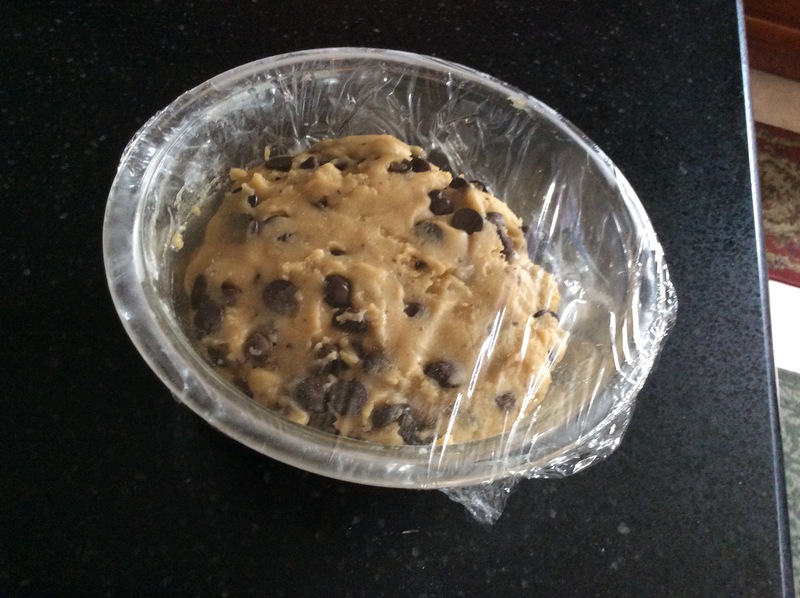 The dough looked very much like a traditional cookie dough. And yes, I tasted it raw, and it tasted like your typical raw cookie dough recipe. 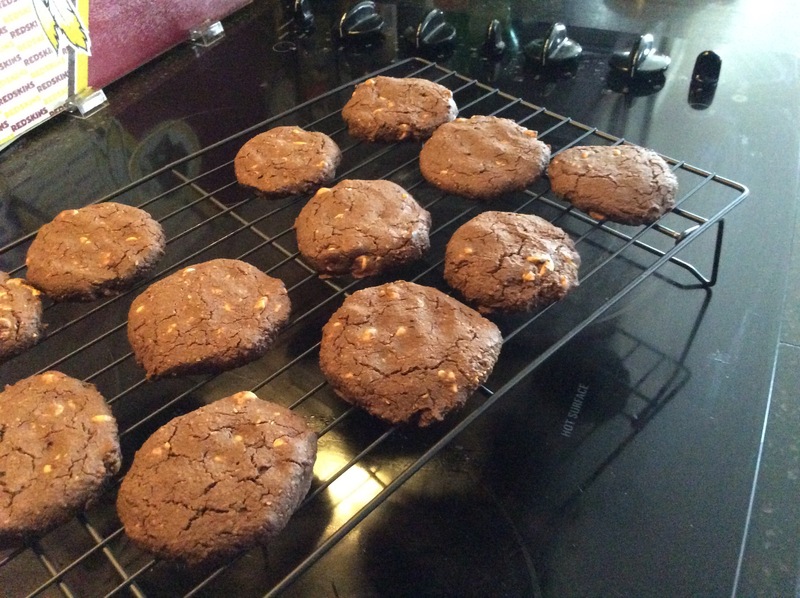 This recipe really mirrors a traditional cookie recipe, just no eggs or butter. Here’s a pic of the dough before baking. I did make a minor change to the recipe, in that I used a mixture of dark chocolate chips and semisweet chocolate chips. But that’s it. Otherwise, I followed this recipe to a tee! The recipe even calls for freezing your dough for 10 minutes before baking. I did just that. And the result? This delicious cookie that was crunch on the outside and moist on the inside. This cookie does not taste vegan at all! The next recipe was from a site that I’ve gone to before for vegetarian recipes, Detoxinista.com. This recipe I used as a base and then added a couple different ingredients to make it a bit different. 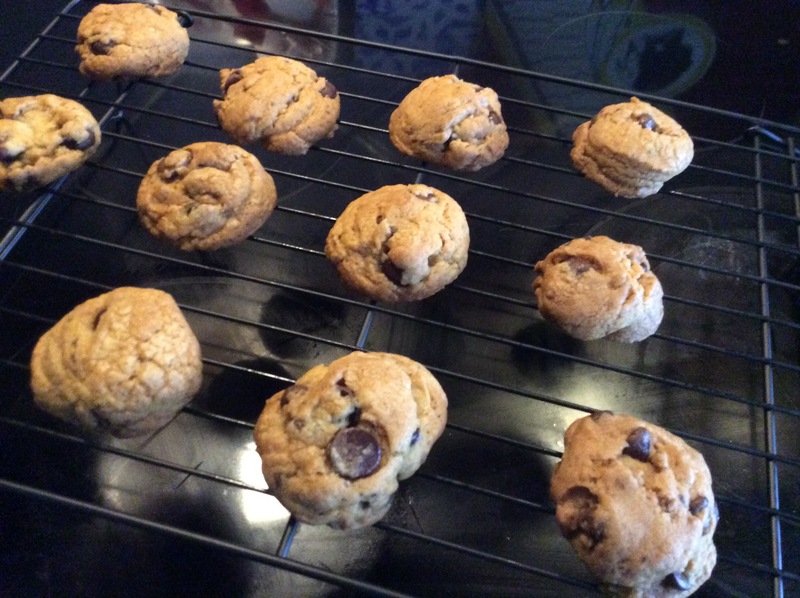 Here is a link to the recipe –> Gluten free chocolate chip cookie. The recipe called for the surprise ingredient of chick peas. Yes…Chick peas! I know you are probably thinking what I did. How in the world is that going to taste good?!? Well all I have to say is….try it! Since this recipe is also gluten free, it uses oat flour instead of regular all purpose white flour. So the dough is a bit gritty and not as smooth as a traditional dough. In my cookie, I followed the directions exactly. But instead of just chocolate chips, I decided to make the batter a chocolate cookie dough with the addition of cocoa powder. I then substituted the chocolate chips with peanut butter chips. 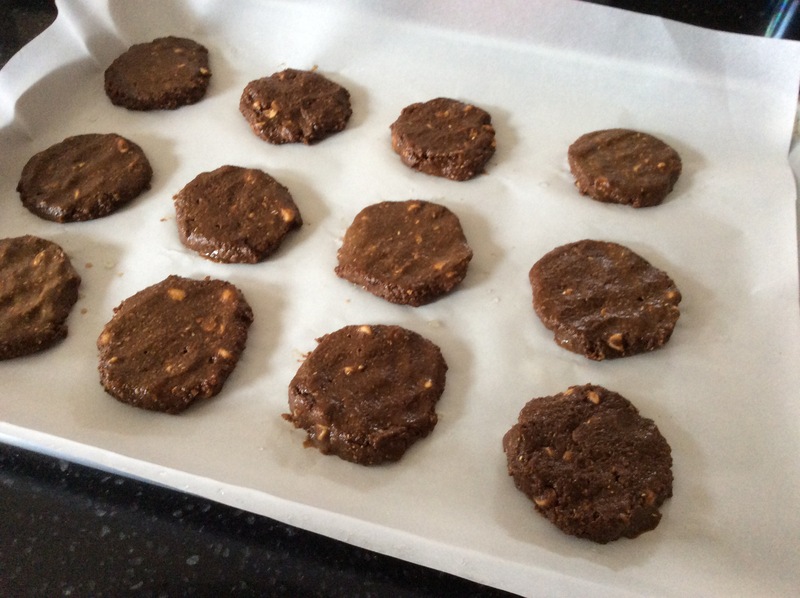 Here is a pic of the cookies before they went into the oven. They look wet because I wetted my fingers to press down the dough before baking. The dough doesn’t spread so I wanted to achieve the shape I wanted before baking. The result? A soft cookie with a yummy taste! This recipe sticks for sure! Who would’ve thought I’d ever be baking with chick peas!?! I am now! Thanks to Detoxinista! Here is the final product! Now my final cookie was the most simplistic recipe that I found. It comes from the site, Powerhungry.com. It is a Two ingredient cookie. Oats and Banana. My first thought was….how can you make a cookie with just two ingredients? Well I’m here to tell you that you can! 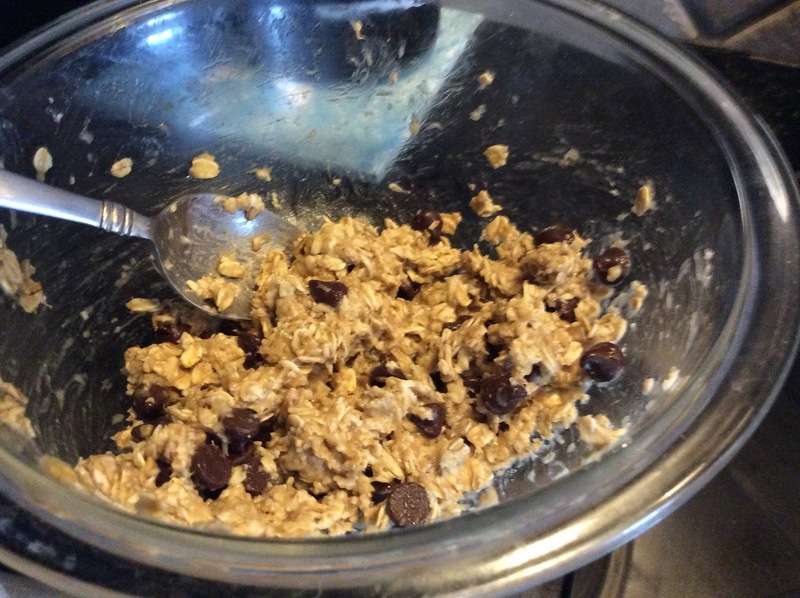 Here is a link to the recipe –> Vegan Oatmeal Chocolate Chip Cookie. Now on her site, she tells you that you can doctor them up anyway you’d like. And she gives a number of options on what she likes to do with it. I decided to stay true to the chocolate chip and left it just to that. But I must admit that adding some coconut and cranberries definitely was on my list for next time. I did add some vanilla and cinnamon for flavoring. Here’s what they looked like going into the oven. Sorry the one pic is blurry. The final product? 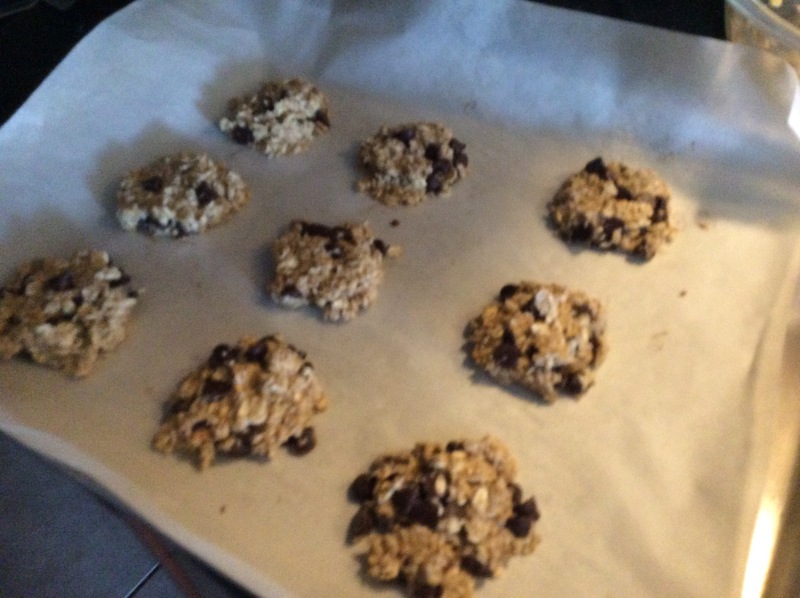 To my surprise, they were delicious and totally felt like an oatmeal cookie. I’m still shocked that they turned out like a cookie. For me, this one is the ultimate vegan cookie. It’s simple. No added sugar. The least unprocessed out of all of them. But It does lack that texture that you look for in a cookie. But don’t get me wrong. I loved it! Perhaps using oat flour instead of plain oats would achieve that texture to make it more cakey. I’ll play around with it. Now the one that tastes more like a true chocolate chip cookie would be the one from Food52. But I prefer to stay away from white flour. So for me, I’ll be using either Detoxinista’s recipe or the Powerhungry recipe. 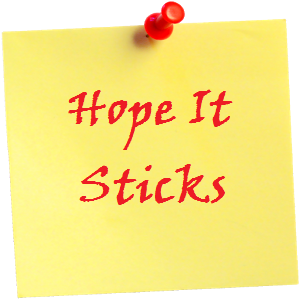 All in all, I’d say all 3 tales….stick and you can’t go wrong with any of them. Enjoy!! « Mushrooms mushrooms oh how I love thee!